Counter-Strike eSports documentary dares you to "Play Bravely"
If gaming can sometimes seem like a solitary experience, Spela Modigt // Play Bravely shows what happens when a group of players finds the chemistry and will to succeed as a unit. The new documentary follows professional Counter-Strike: GO player Jonatan "Devilwalk" Lundberg and his Fnatic team as it attempts to win the Dreamhack Winter 2013 tournament. 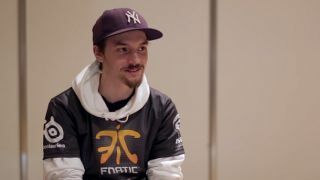 A support player in the Fnatic Counter-Strike squad, Lundberg likens himself to a psychologist or "shrink," as he puts it, in that a big part of achieving any goal is keeping people together and focused on a single objective. "We are a team that doesn't really change," Lundberg says in the film. "We've had the same core players since the start of the year and that's really, really unique. People quit, people change lineups because they get in fights, can't resolve their issues. So they just start over, which is the wrong way to go I think." As well as offering polished insight into some of the personalities behind a top eSports team, director Zacharias Dyrborg's film features some great play-by-play action of competitive Counter-Strike and works to explain the mindset of the Fnatic team before and after each match. For me, it showed that while skill will almost always show itself in highly stressful situations, success can also depend just as much on understanding how to take advantage of the emotional side of competition.